Perhaps because I was born before the 20th century’s mid-point, i.e. before 1950, I’ve just not quite gotten the “hang” of blogging. And, to be honest, I’m thinking I may be a bit too old to master this particular “new trick.” Please follow this link if you need a reminder about just how recently internet communication became widely available and utilized. As a way to start out slowly on this blogging venture, I’ve decided to direct readers to a couple of exceptionally good bloggers–people I know personally and hold in high regard. Each of them offers deeply significant and often seriously humorous (or, humorously serious) reflections on a wide range of contemporary realities. I hope you’ll enjoy them. I hope they will challenge and inspire you. They certainly have that effect on me! One of the bloggers is my very good friend, Marian Ronan, PhD, who was professor of theology at ABSW from 1997 to 2008 and later served as visiting professor at New York Theological Seminary. The other blogger I want to introduce is David R. Henson who earned his M.A. in theology at ABSW\GTU, and is an ordained Episcopal priest. I had the great pleasure of studying with David in a course I offered on earliest Christianity’s various understandings of Jesus of Nazareth as the Christ. I’m certain I learned more from him than he did from me, though he graciously insisted that the resources used in the course were compelling in ways that enabled him, as he said, “to pursue some ‘really new’ lines of thought” on the subject. Both Marian and David are extraordinarily insightful observers of local, national, and global issues. They are also conversant about, and engaged with, the variety of ways communities of faith are responding to these issues. Marian’s blog is entitled “Marian Ronan: An American Catholic on the Margins,” and you can read her blog posts at this web address. She’s a brilliant, critical, and deeply insightful Christian theologian. David’s blog is entitled “Edges of Faith,” and is on the Progressive Christian Channel at the PATHEOS website. He, too, is brilliant, critical, and insightful. Finally, a word of warning: One of David’s great gifts is SATIRE. In a recent post, “World Leaders Close Borders in Fear of Renewed Terrorist Attacks” he reflects on the violence perpetrated not by Syrians or people of color in the U.S., but by white Americans. As one who belongs to that particular group, I was at first shocked, and then quite humbled, when I read David’s compelling piece. Dr. Margaret McMannus is Associate Professor for Historical and Theological Studies. The Rev. David Henson from ABSW on Vimeo. In celebration of U.S. Women’s History Month 2015, the ABSW community is invited to remember and to honor the African American Christian Women presented here. Collectively, their lives establish a historical trajectory stretching from 1783 to 1964, but until fairly recently these and countless other African American women have not received the recognition they deserve for their extraordinary contributions in charting the course of U.S. history. Jarena Lee was the first woman known to petition the African Methodist Episcopal Church “to be permitted the liberty of holding prayer meetings in my own hired house, and of exhorting as I found liberty,” a request granted in 1819 by Bishop Richard Allen. Before the Civil War, Sojourner Truth was a feminist abolitionist and afterwards a tireless worker in providing relief and job placement to freed people. Maria Stewart, a woman of profound religious faith, a pioneer black abolitionist, and a defiant champion of women’s rights, was the first American woman to lecture in public on political themes and leave extant copies of her texts. Harriet Jacobs authored the most important slave narrative by an African American woman, Incidents in the Life of a Slave Girl, Written By Herself (published in 1861). Rooted in and guided by her deep spiritual faith, Harriet Tubman escaped her slave owner in 1849 and by 1854 had become an indispensable figure in the abolitionist and Underground Railroad networks of Philadelphia, New York, and Boston. An extraordinarily gifted, prolific American literary figure, Harper was also a compelling abolitionist lecturer, staunch supporter of the Underground Railroad, and a founder of the American Woman Suffrage Association (1866) and of the National Association of Colored Women (1898). She was on the national board of the Women’s Christian Temperance Union (WCTU), published extensively in the Christian Recorder and appears in Bishop Daniel Payne’s 1891 History of the AME Church. Utilizing her journalistic pen and a tireless activism, Wells-Barnett fearlessly devoted her life to the cause of justice for African Americans. Born into slavery in Mississippi, in 1879 she moved to Memphis where she taught school and edited the newspaper, Free Speech and Headlight. Her sustained campaign against lynching led to her 1892 investigative report, “Southern Horrors: Lynch Law in All Its Phases” and to both national and international speaking tours. A scholar, public school teacher, social activist and author, Cooper is best known for her book A Voice from the South by a Black Woman of the South (1892). In 1914, she studied at Columbia University (New York), and in 1925 earned a doctorate from the Sorbonne (Paris). In 1930 she became president of the Frelinghuysen Group of Schools for Employed Colored Persons (Washington, DC). During her long lifetime Cooper continuously articulated and refined her analysis of two insights: that oppressive social power is a global structure and that those most severely affected are the world’s women of color. 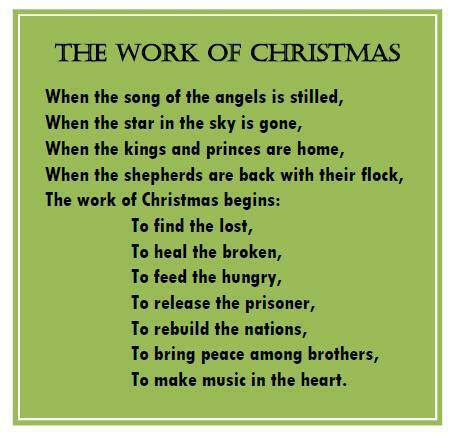 A number of years ago, I found—entirely by accident—a poem entitled “The Work of Christmas” by the renowned 20th century theologian and pastor, Dr. Howard Thurman. Every Christmas season since, I have rummaged through my—entirely disorganized—box of “special quotes and writings” to locate Dr. Thurman’s poem. It is the most meaningful comment on Christmas that I have ever encountered. May Dr. Thurman’s words inspire us. May the accompanying music fill us with profound energy. Today and everyday let us joyfully do “The Work of Christmas”. A wealth of information about Howard Thurman’s life, work, and publications, as well as a current documentary film project about him, is available at http://www.howardthurmanfilm.com. This site also includes an annotated bibliography in pdf form–http://www.howardthurmanfilm.com/images/Thurman_Bib.pdf. Music for Dr. Thurman’s poem was written by Elizabeth Alexander. Access two different performances of the poem/song at— http://www.elizabethalexander.com/works/when_the_song_of_the_angels_is_stilled.html.